Original recipes by Terry Thompson. Recipe adapting, photography and styling by Tanya Zouev. In my local area, the council has a lot of hard rubbish collections. Meaning that householders are given a couple of times a year to put their unwanted bulky trash out for collection by a giant garbage truck. What you’re supposed to put out is broken furniture, busted appliances and household goods. In reality residents put out goods which should be going nowhere near landfill just because they can’t be bothered to take them to a charity shop (for example, clothes still with the tags on them, I kid you not). I make it a point to go and see what has been put out, mostly in the hope I can salvage some of it for either personal use, for family and friends or for donations to our local op-shops. The other reason is the voyeuristic side of my personality enjoys seeing what was formerly on the inside of peoples homes, because it intrigues me. I mustn’t be the only one because hunting through hard rubbish is so popular on this side of town it’s even called “street shopping”. It struck me some time ago that the quantity of cookbooks, kitchenware and appliances tossed out is quite immense. Aside from mattresses, foot spas and BBQ’s I see huge amounts of various kitchen appliances tossed out. They are mainly cheap ones from Aldi and K-Mart along with the occasional gimmick appliance like hot-dog or fairy floss makers. The most common kitchen appliance thrown out is the toaster followed closely by the 1970’s upright grill. I remember my own parents had one of those, a shiny Sunbeam retro number and from what I can recall it made a mean grilled chop. I was excited when the street on which I live had a council clean up just a couple of weeks ago and out the front of number 37 were a few cookbooks and a rechargeable Ronson parmesan cheese grater from the 1980’s. I looked them over and decided to take the lot. 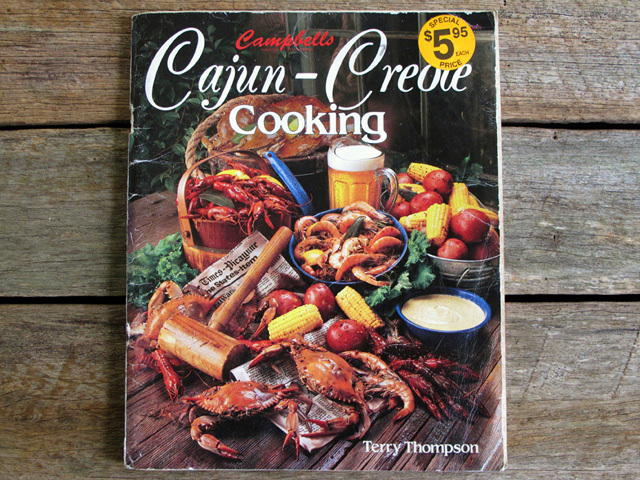 The book that took my interest the most was the Cajun-Creole cookbook written by Terry Thompson, published in 1986. I flipped through it after chuckling at the typically 1980’s styled front cover (take note of the wildly illuminated beer glass). I decided to Google Terry Thompson and it turns out she is a very well known Cajun and Creole cookbook author, and the reviews of her recipes on Amazon are largely five star. At first sight I thought the book was incredibly dated and the food fussy and old-fashioned. The cuisine uses an awful lot of wheat flour, meat, bread and way too much oil. I realise that the book is from a time when eating for optimum health and nutrition weren’t on the top of most people’s dietary priorities and the recipes are certainly not health-conscious. Many recipes are deep fried and that which aren’t are usually drowning in butter. I don’t know anything about Cajun and Creole cooking except that Masterfoods make a Cajun seasoning blend I think I once used to make a chicken salad fifteen years ago. However, three recipes sparked my curiosity and I decided to recreate them for this post and photograph them. Rather than having the book end up in landfill, I decided to dust it off, take it home and cook three recipes from The Cajun-Creole Cookbook. At the end of the recipes I give my overall opinion. *Please note that if you are going to attempt to cook any of these recipes yourself, you must read my notes under the author’s method under each recipe. This is due to the fact the recipes are mostly incorrect as far as quantities of ingredients and cooking times. I believe this may have happened in the American to Australian conversion of the recipe and weren’t corrected tested at time of publication. Preheat oven to 175 degrees Celcius, (350F). Lightly butter a 1-1.5 litre casserole dish. Using a sharp knife, cut off and discard root end from each onion; set aside. Fill a 4 to 6 litre saucepan half full of water, bring to a boil over medium-high heat. Add onions, parboil one minute. Drain into a colander, place under running water to cool. When onions are cool enough to handle, peel by grasping between your thumb and forefinger at stem end and squeezing lightly. The peel should come off easily. Set peeled onions aside. In a heavy 30-cm skillet over medium heat, melt butter. Add celery, cook 5 minutes. Add peeled onions and spring onions, stir to blend. Sprinkle flour into skillet, stir until combined. Cook 3 to 4 minutes, stirring. Blend in salt, pepper and Tabasco sauce. Slowly stir in the half milk and half cream. Cook about five minutes, fold in 2/3 cup almonds and the cheese. Pour into a buttered baking dish. Bake in preheated oven until bubbly and lightly browned, 25 minutes. Top with toasted and almonds and celery leaves if desired. This dish was rich, like crazy artery-clogging rich. As I was using larger pickling onions I needed to parboil them for well over five minutes before they even started to show signs of slipping out of their skins. Even then they refused to slip out so I had to cut them out. I cut the onions in half and peeled off the skin and outermost layer. I added a sprinkle of sweet paprika to the top and baked it for 30 minutes because it wasn’t quite browned enough after 25. The taste? Well, rich and onion-y, you might use it as a side for a roast chicken if you like that sort of thing. I felt it needed something else, like potatoes. I did however really like the crunch of the toasted almonds and will incorporate that into another recipe. 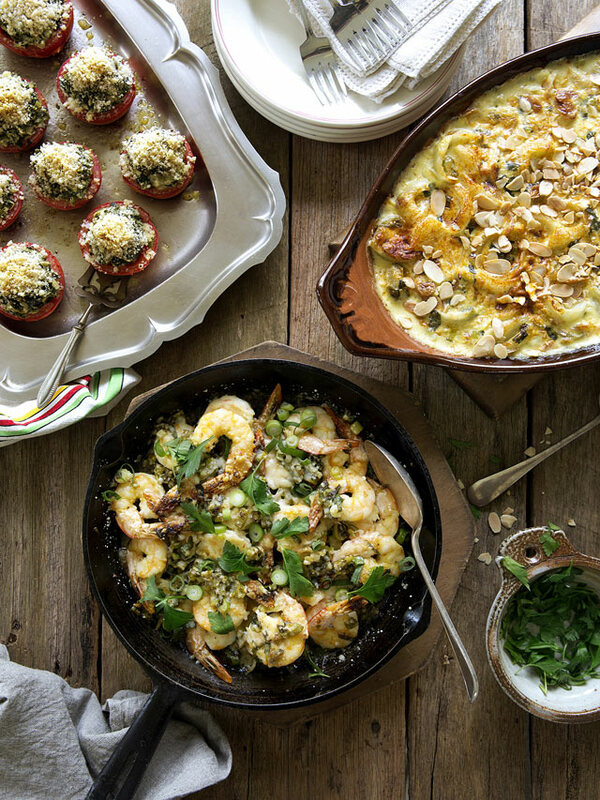 Divide shrimp equally among 4 small au gratin dishes, set aside. In a heavy 2 litre saucepan, heat butter with olive oil. Add remaining ingredients except cheese and parsley sprigs, cook 5 minutes over medium heat. Position oven rack 10cm below heat source. Preheat broiler (grill). 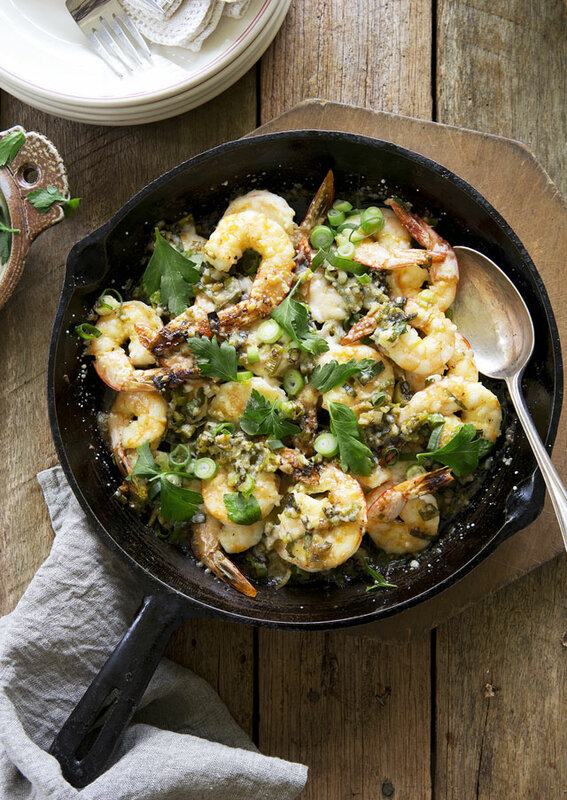 Pour garlic-butter sauce equally over shrimp, top with a generous sprinkling of cheese. Place au gratin dishes on a large baking sheet. Broil under preheated broiler until shrimp are coral-pink and sauce is bubbly and lightly browned, about five minutes. Garnish with parsley sprigs. Serve hot. This was the recipe I was the least confident with because overall it just didn’t sound right but I wanted to see what prawns and cheese tasted like together in this particular combination. The original recipe called for two kilos of prawns which is a lot, especially for the relatively small quantities of the other ingredients (with the exception of the large amount of butter and oil) so I decreased it to one. I don’t know how the author managed to fit so many prawns into a few au gratin dishes unless they were enormous so I decided to do them in a cast iron fry pan. This way I could start off the cooking on the stove for a couple of minutes and then pop them under the grill. One kilo was a good number of prawns for my 35cm fry pan but I still needed to extend the cooking time. I ended up cooking the prawns for about 6-7 minutes then turning them over and cooking the other side for about that again. I poured the garlic-butter sauce over the prawns and put them back under the grill for another minute. Finally I scattered fresh spring onions and flat leaf parsley over the prawns, and no I didn’t use curly parsley sprigs. As for the taste? I liked the garlic-butter flavour but felt the dish could easily have done without the cheese. It also didn’t need quite as much butter and oil as the ingredients stated. Preheat oven to 175 degrees Celcius (350F). Halve tomatoes crosswise. Carefully scoop out and discard pulp and seeds, taking care not to puncture shells. Sprinkle inside of each tomato with salt and pepper, set aside. Drain artichoke hearts, chop drained artichokes. Press out all moisture from spinach. In a medium bowl, combine pressed spinach, chopped artichoke hearts and spring onions. In a food processor fitted with the steel blade combine cream cheese, 1 tablespoon butter, sour cream, oregano, 1/2 teaspoon salt and Parmesan cheese. Process until pureed. Fold cream cheese mixture into vegetables until blended. In a small bowl, combine 2 tablespoons butter with bread crumbs with a fork. Stuff tomato halves with spinach filling, top with buttered bread crumbs. Place in 32x22cm baking dish, bake in preheated oven until heated through, 10 minutes. Do not overcook. Serve hot. I was quite excited about these but honestly they were a bit of a disappointment. There was way more filling specified than actually required, hence the decision to make more tomatoes and I still had some leftover. They were on the bland side and tasted uncooked after only ten minutes in the oven (the spinach had a raw flavour and not in a good way). I put them in for another five minutes to brown up the crumbs and got them out just as the skins started to split. They definitely needed more flavour, perhaps a chopped eschallot and some garlic. Overall the book was a retro novelty cooking experience for me and it reminded me of the type of food served at wedding reception venues in the late 1980’s. I was a wedding photographer’s assistant in those days so I got to eat my fair share of prawn cocktails and beef wellingtons as well as other fancy Eighties fare. I know for sure that this type of cooking is not my thing as I would like to keep my cholestorol levels down. Will I cook any of the dishes again? No, but I got a taste of Creole-Cajun cookin’, had some fun in the kitchen and I will take an element or two from these and use them some place else. Just not the curly parsley sprigs. Recipes adapted from Cajun & Creole Cooking by Terry Thompson. This shoot was fun to do as I knew I wanted to use all vintage props. I went out the day before the shoot to our local Vinnie’s and Goodwill and found the fancy stainless steel baking dish and the crazy huge glazed terracotta gratin dish. Everything else except the tea towels came from Vinnie’s and Goodwill. The beautiful grey-ish crinkled tea towel is from Etsy seller Knock Knock Linen. The French striped tea towel is from Etsy seller French Vintage Linens. A huge thank you to my neighbour Jamie for banging up the old wooden background for me.